The Preceptor Education Program development team came together in 2006 to create the first edition of the program. The team included: Ann Bossers (Occupational Therapy, Western), Mary Beth Bezzina (Project Coordinator), Sandra Hobson (Occupational Therapy, Western), Elizabeth Anne Kinsella (Occupational Therapy, Western), Ann MacPhail (Physical Therapy, Western), Susan Schurr (Communication Sciences and Disorders, Western), Taslim Moosa (Communication Sciences and Disorders, Western), Karen Ferguson (Nursing), Sandy DeLuca (Fanshawe Nursing), Jennifer Macnab (epidemiologist/statistical advisor) and Karen Jenkins (PHN, Middlesex-London Health Unit). A support member to the team was Lynda Rolleman (work study student). In addition, Dr. Richard Ladyshewsky, (Curtain University, Australia), joined the team as an international expert to design a special guest module on the topic of peer coaching. IT support was provided by Eva Placko, Angela Vandenbogaard and Jane Winkler (Western). 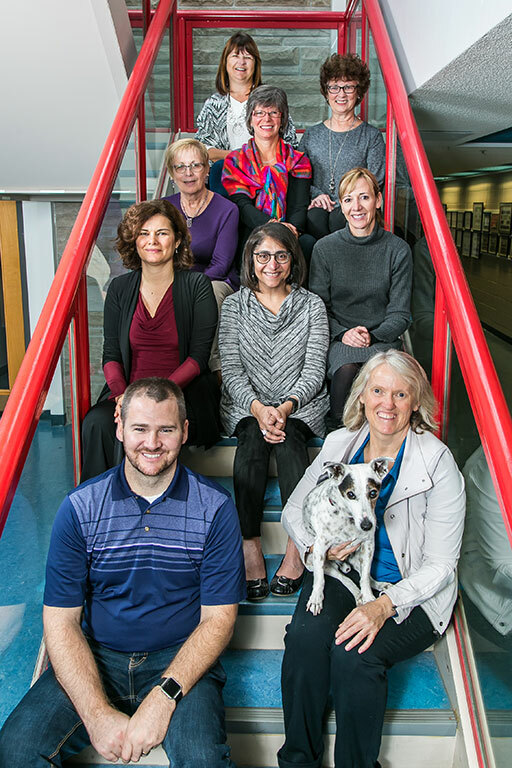 Over the years, the team has undergone some changes, however, remains committed to ensuring the program remains relevant and useful to support students and preceptors in health professions programs as they work together to provide learning environments that will prepare students for the real world of professional practice. For the second edition of the program, the development team included: Elizabeth Anne Kinsella (Occupational Therapy, Western), Ann Bossers (Occupational Therapy, Western), Karen Ferguson (Nursing, Western), Karen Jenkins (Nursing, Fanshawe College), Mary Beth Bezzina (Occupational Therapy, Western), Ann MacPhail (Physical Therapy, Western), Taslim Moosa (Communication Sciences and Disorders, Western), Susan Schurr (Communication Sciences and Disorders, Western) and Julie Whitehead (Instructional Design, Faculty of Health Sciences, Western). Mary Beth Bezzina served as coordinator of the second edition, and led the implementation of the pilot test. Many of the learning quizzes, learning objects, navigation, and design elements have been developed by Julie Whitehead. The team is grateful to Kim Holland (Evaluation Consultant, Western) who conducted an independent evaluation of the first and second edition of PEP, and who lead the design and analysis of the pilot test evaluation for the new modules. Thanks to Dr. Richard Ladyshewsky who was our expert contributor in the Peer Coaching module. Work Study students Victor Wu and Mohamed Moselhy also made valuable contributions in supporting technological updates to the online program. The team hired CPIPE Productions to create animated and voice over videos. The team is deeply appreciative for the generous insights of students and preceptors who pilot tested the second edition. We offer these revised and newly developed resources to our colleagues and students in the hope that they contribute to a positive learning experience. In 2007, an Interprofessional team from the University of Western Ontario, Fanshawe College and the Middlesex-London Health Unit (PHRED Program) received funding from the Ministry of Health and Long Term Care to develop an open access, online modular program for health professional students and preceptors. The topics and format of the Preceptor Education Program were chosen based on an extensive review of the existing preceptor programs, the research literature, and a survey of 600 clinicians, students and academic faculty. Eight learning modules were developed and pilot tested. Over the years, more than 20,000 people have accessed the program. In 2015, a new grant to update the program was obtained through the Council of Ontario Universities from the Ontario Online Initiative of the Ministry of Training, Colleges and Universities. All existing modules have been enhanced and one new module has been added. The updated modules feature new learning activities, downloadable resources, interactive exercises, animated case scenarios and references. A pilot test of the second edition was completed by 80 students and preceptors, and feedback informed revisions completed prior to the January 1, 2016 release. Kinsella, E. A., Bossers, A., Jenkins, K., Hobson, S., MacPhail, A., Schurr, S., Moosa, T. & Ferguson, K. (2015). Interprofessional Preceptor and Preceptee Educational Programming: An Interdisciplinary Needs Assessment. Focus on Health Professional Education, 16(2), 70-87. Bossers, A., Phelan, S., Kinsella, E. A., Jenkins, K., Ferguson, K., Moosa, T., Schurr, S. & Hobson, S. (2014). Participants’ self-identified learning outcomes in an online preceptor education program for health professionals and students. The Journal of Practice Teaching and Learning, 13(3), 79-97.